This article describes how to prepare Azure resources and components so that you can set up disaster recovery of on-premises VMware VMs, Hyper-V VMs, or Windows/Linux physical servers to Azure, using the Azure Site Recovery service. This article is the first tutorial in a series that shows you how to set up disaster recovery for on-premises VMs. Verify that the Azure account has replication permissions. 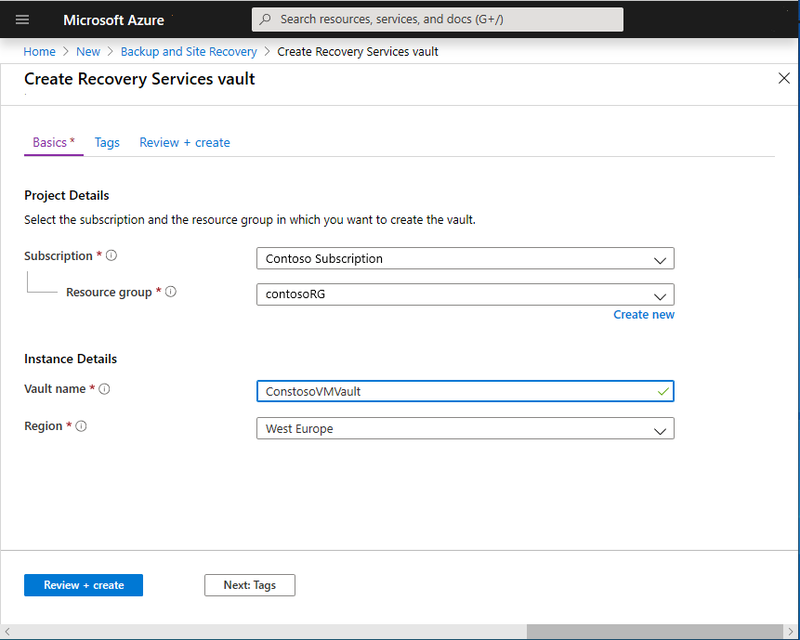 Create a Recovery Services vault. A vault holds metadata and configuration information for VMs, and other replication components. Set up an Azure virtual network (VNet). When Azure VMs are created after failover, they're joined to this network. Review the architecture for VMware, Hyper-V, and physical server disaster recovery. If you don't have an Azure subscription, create a free account before you begin. Then sign in to the Azure portal. Create a VM in the selected resource group. Create a VM in the selected virtual network. Write to an Azure storage account. Write to an Azure managed disk. To complete these tasks your account should be assigned the Virtual Machine Contributor built-in role. In addition, to manage Site Recovery operations in a vault, your account should be assigned the Site Recovery Contributor build-in role. In the Azure portal, click +Create a resource, and search the Marketplace for Recovery. Click Backup and Site Recovery (OMS), and in the Backup and Site Recovery page, click Create. In Recovery Services vault > Name, enter a friendly name to identify the vault. For this set of tutorials we're using ContosoVMVault. In Resource group, select an existing resource group or create a new one. For this tutorial we're using contosoRG. In Location, select the region in which the vault should be located. We're using West Europe. To quickly access the vault from the dashboard, select Pin to dashboard > Create. The new vault appears on Dashboard > All resources, and on the main Recovery Services vaults page. On-premises machines are replicated to Azure managed disks. When failover occurs, Azure VMs are created from these managed disks, and joined to the Azure network you specify in this procedure. Keep Resource Manager selected as the deployment model. In Name, enter a network name. The name must be unique within the Azure resource group. We're using ContosoASRnet in this tutorial. Specify the resource group in which the network will be created. We're using the existing resource group contosoRG. In Address range, enter the range for the network. We're using 10.1.0.0/24, and not using a subnet. In Subscription, select the subscription in which to create the network. In Location, select the same region as that in which the Recovery Services vault was created. In our tutorial it's West Europe. The network must be in the same region as the vault. We're leaving the default options of basic DDoS protection, with no service endpoint on the network. The virtual network takes a few seconds to create. After it's created, you see it in the Azure portal dashboard. For VMware disaster recovery, prepare the on-premises VMware infrastructure. For Hyper-V disaster recovery, prepare the on-premises Hyper-V servers.